Down in the ‘red’ cellar at Edi Simčič in Brda Slovenia. Iarrive at Edi Simčič Winery a few minutes early for my appointment. It’s quiet, and twilight colors the sky. I’m looking for winemaker Aleks Simčič, Edi’s son. Rolling down the concrete driveway, I park my bike between two buildings. I see a tractor, several empty grape bins, and a dog. After a few minutes, an elderly man walks out of one building and greets me. He doesn’t speak English, though he asks me if I speak Italian. I try to use a little Spanish, which is a stretch. It doesn’t take long to realize this is Edi Simčič. As we talk, we fill in the gaps between our languages by sketching numbers and pictures with our fingers on the dusty wall of the building. Edi is eighty-five years old, yet moves with a brisk strut and has a tuft of white hair, thick glasses, a polo shirt and a gold necklace accented with a stone. We find Jure, his grandson, who calls his dad to let him know I’m here. I’m told Aleks likes to ride to his vineyards on his bike, and he is out visiting one nearby. Wow, I think…today I’ll chat with the first winemaker I’ve ever met who rides a BMW GS motorcycle. Since I started riding the world and documenting these adventures, I know I’ve attracted many motorcycle riding readers, and I’m so grateful for that. While I know many of you share my passion for riding and exploring by motorcycle, I also realize some of you may not share my enthusiasm for wine and the culinary arts. I still would like you along for the ride, and here’s why—like motorcycles, wine is a great human connector. And while some winemakers, chefs, and wine lovers may not share a passion for motorcycles, what we all share is a passion for life and human connection. A connection where we find common ground and share with each other something we love. This is what’s important. I ask you, wherever your passion lies—try to be open about it. By broadening our minds and unleashing our imaginations we can expand our interests well beyond the borders of our shared experiences. Then together we get to experience just how good it feels—or even tastes! Jure invites me down to the cellar, which has recently undergone an expansion. They’ve tunneled underneath where I parked my bike to create another barrel room. With the expansion, Jure tells me they now will have white wines in one cellar and red wines in the other. At first look, it appears like a new house where boxes and furnishings wait to be unpacked. Yet in the sound of Jure’s voice, I sense relief that not only is the cellar done, but that they are ready to use the extra space. 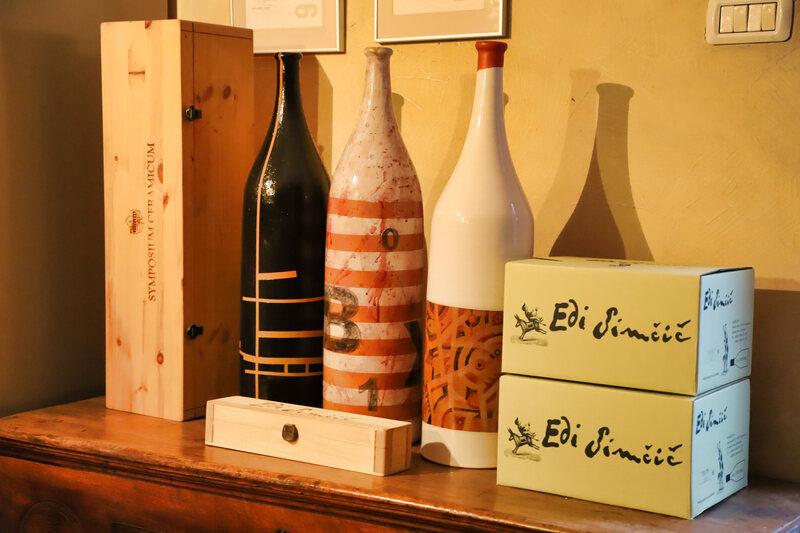 Edi Simčič produces about 60,000 bottles a year, which varies based on vintage. At twenty-five, Jure speaks with the wisdom and insight of an old soul—I’m sure with the influence of his dad and grandfather. He tells me the wine they produce the most of, at about 5,000 bottles, is a red blend called Duet. Next with about 4,000 bottles is Rebula, the white grape varietal I was most unfamiliar with until I arrived in Brda a few days ago. 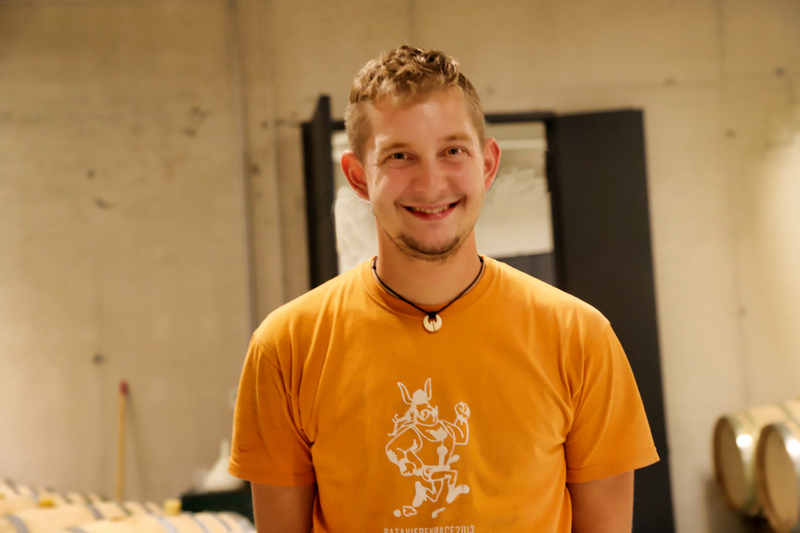 Jure Simčič, at twenty-five, he’s the third generation Simčič and is passionately dedicated to quality—and Rebula! “I think it’s the most important varietal,” Jure explains–“this is the one grape we need to work on” and it takes a lot of work, as the grape is wildly vigorous, thick-skinned and needs a lot of sun. There are about six-hundred grape growers in the region. Four hundred of these growers sell their grapes to the local Co-operative. During Yugoslavia times the government owned it. Today, it’s private, and Jure tells me they do a good job making and selling Rebula. It’s marketed for export under the Avia brand. With its extensive production and expansive distribution, this helps the other growers with awareness for Slovenia and Rebula. “To make the best Rebula you must plant in the best position in the vineyard,” he explains. “Because it’s so vigorous, we must plant it in the poorest soil—with more rocks and little water.” He tells me if they plant Rebula in good soil with normal water conditions the yields will be enormous and the grapes will be bigger and thicker skinned. “Then the wine you get will be like water with alcohol,” he says. Even with the poor and rocky soil, it’s critical to harvest at the optimum time, he says. There’s little flexibility. If you pick when it’s under-ripe, it’s tannic, and you’ll get the opposite of what you’re shooting for. I tell him about the Rebula grape I tried yesterday and how thick it was. “Like chewing gum, right?” I nod. The white wine barrel cellar at Edi Simčič winery in Brda Slovenia. 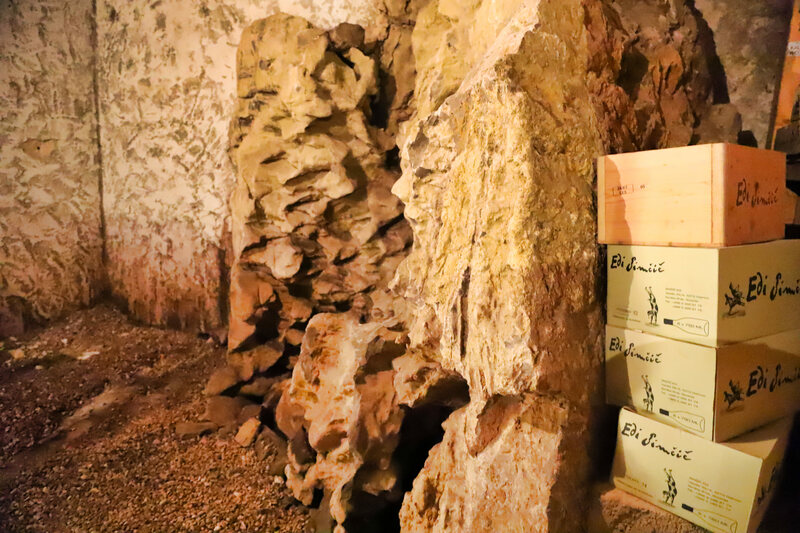 The Edi Simčič cellar expansion reveals the rocky tough soil that gives wine made from grapes grown here its uniqueness. We walk into the other barrel room. All the Edi Simčič wines are barrel fermented—except for the rose. The barrels hold the wine until it’s ready for bottling. We walk upstairs where there are boxes and bottles of wine just bottled and waiting for labels. Before the expansion, all of they had to crowd both the inventory of current releases and wines aging into one cellar and one room. I love the whimsical labels and branding used by Edi Simčič. I mention I like the whimsical labels of the Edi Simčič wines and ask if the dog on one label is a drawing of the dog that greeted me. “No, that dog came later. We had a dog before, but it’s not the same dog,” he explains the labels further. “The reds have gnomes, the single-vineyard Chardonnay has a goat, and the other white wines have a dog. Just then Aleks shows up. It’s nearing twilight hour, and with each minute the mosquitoes get more aggressive. Aleks squirts insect repellent into his hands and rubs it onto his neck, arms, and ankles. He hands me the bottle, and I follow suit. “They’re aggressive,” he says as he smacks one that landed on his arm. 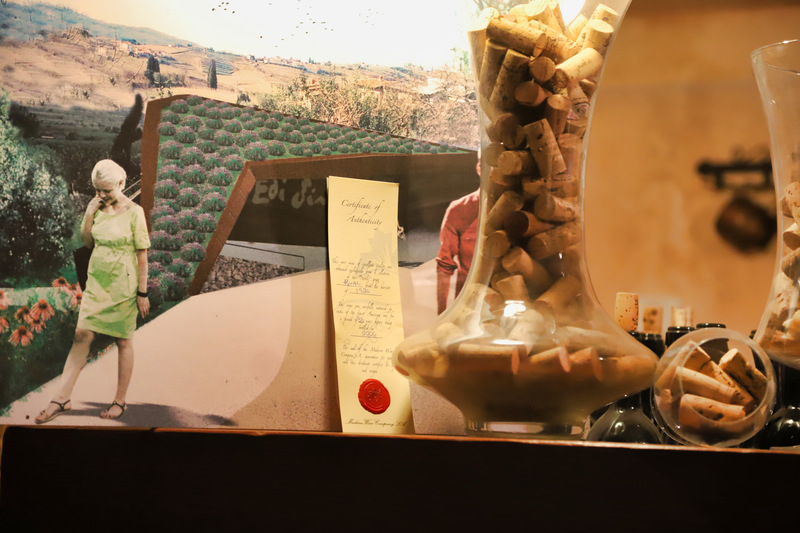 We walk into a small room lined with wine bottles, vases filled with corks, photographs, and wine boxes. There’s a small wooden table covered by a thick plate of glass with few chairs and two small wine refrigerators. A large wooden display case houses crystal wine glasses. 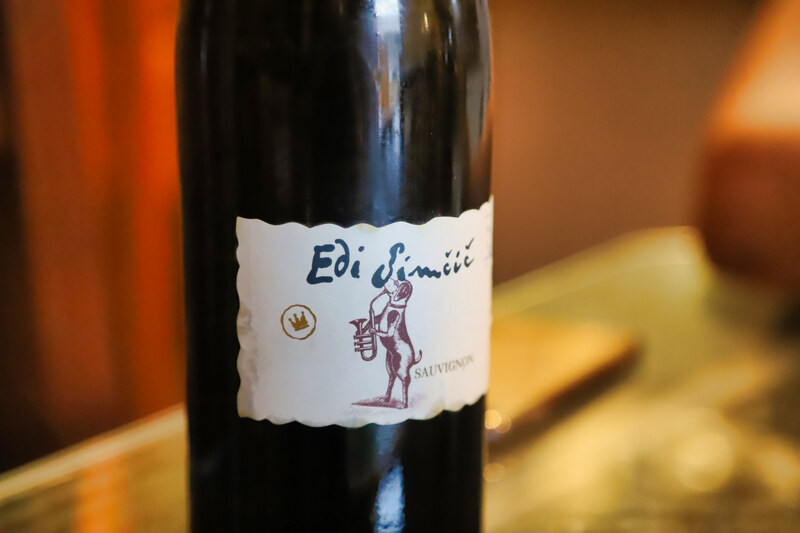 We sit down and delve deeper into the history and evolution of Edi Simčič winery and its wines. 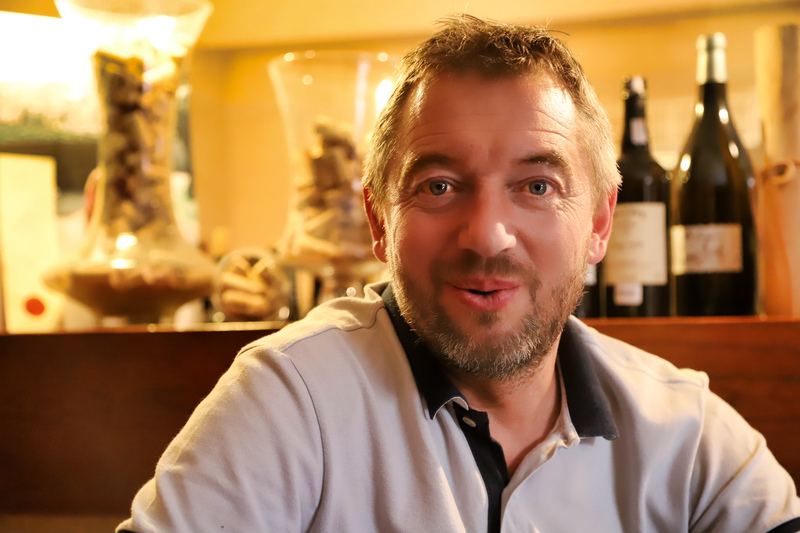 Aleks Simčič brings essential business experience that combined with his passion and instinct contribute to world-class wines and a successful business in Slovenia. 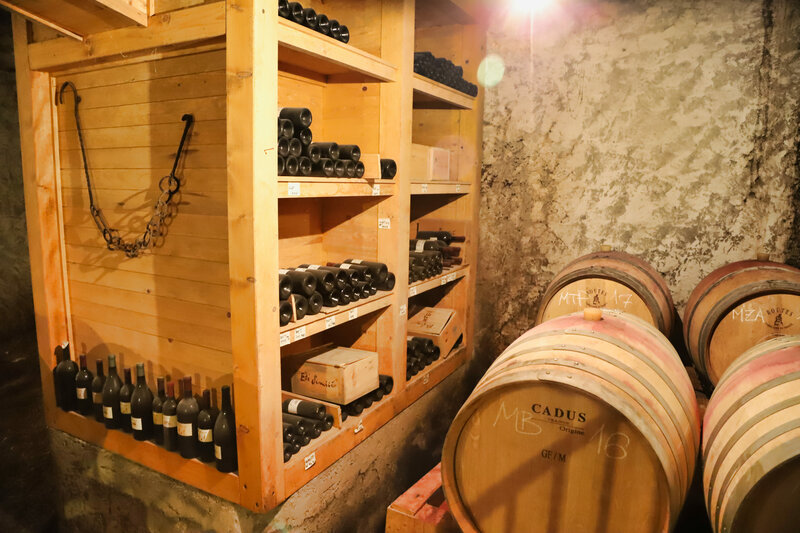 In 2002 they built the first cellar under the house, the expanded that cellar in 2005 by adding a bottling room, and then created a long cellar for aging red wine in 2010 which stretches across the street to under a tourist villa that the family owns. The entire villa which includes two bedrooms with bathrooms, a swimming pool, wellness area, sauna and jacuzzi, a gallery, living space, fully equipped kitchen, and an outdoor living and grilling space. Not only is this a great tourist destination, but it also allows Edi Simčič to provide accommodation for distributors, sales representatives, and customers around the world. During the high season, guests rent it for weeks at a time, and for long weekends during the slow season. They recently bought a large house they will convert into a small hotel or guesthouse with about a dozen rooms. As Aleks explains his plans, I realize he is looking at the winery as one part of a holistic wine country experience. He plans to make available a banquet and meeting room so he can offer a wine country retreat, for both tourists and business. “We can do business tourism, management meetings, those things which for the winter which is low season for the tourism. We have a tasting room and a meeting room. This is perfect. He pulls the cork off a fresh bottle of Rebula and pours me a taste. The wine is not very aromatic, but has an incredible minerality, sweet tannins and is thick and viscous. When I ask him what grape varietal might be the ideal identity for Slovenia, in how Malbec is for Argentina, Shiraz for Australia or Sauvignon Blanc is for New Zealand, he pauses and thinks. 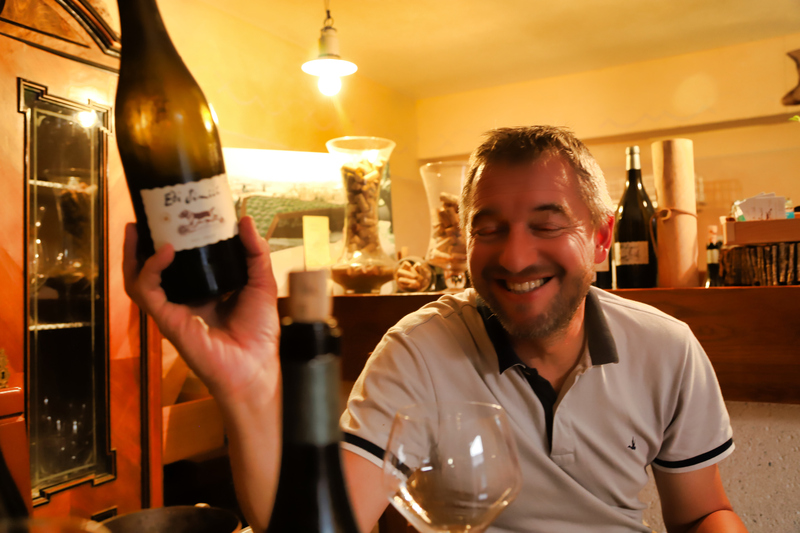 Tasting the wine portfolio at Edi Simčič in Brda Slovenia with winemaker Aleks Simcic. Aleks feels it’s tricky. He thinks that in some regions growers don’t focus. Instead, they try to plant everything. Aleks maintains that Slovenia is a traditional wine growing country with a long history. This is because in most areas the configuration of the terrain makes it too difficult for machines. He argues that perhaps instead of a single varietal, that Slovenia’s opportunity—or identity—in the world market lies in its approach to winemaking which he feels should be quality, if not premium quality. “I think the only direction for Slovenia is to maintain higher level wines. We’re not a mass production country. So I think important to go for high quality, upmarket wines.” he insists. “To find the potential for one or two varietals is tough. There’s too much variation in some areas. 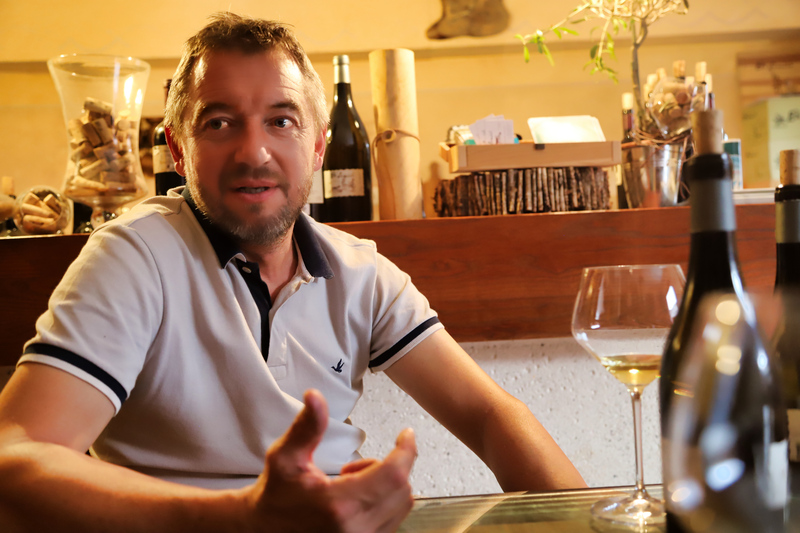 Winemakers continue to search, but they don’t understand the how the varietals are stylistically and relate to the land,” he is thinking out loud while reaching the same conclusion—Slovenia should be quality and upmarket. He shakes his head for a moment. “Some places here in Slovenia they still sell wine for making spritz,” he laments referring to mediocre wine that people mix with sparkling water. “This is a problem.” The first time I experienced this “spritz” was in Croatia where they also refer to this mix of water and wine as gemišt. I take another sip of the Rebula, I get more of that minerality, a tad of sweetness. He expands on the discussion I had with his son, Jure earlier. I ask him how he trains the people who harvest—to teach them how to recognize such vital details. “We don’t, we must do it ourselves. We do it as a family and with only a couple of workers.” They will go through Rebula vineyards before harvest and drop those grapes and clusters that won’t work. When they harvest that vineyard, the workers will only harvest the grapes still on the vines. Nothing like the color of Rebula, a white wine grape native to this part of Slovenia. He holds up his glass of Rebula, and I follow suit. “This is Rebula, this is like yellow when it is ripe it looks orange almost brown. If you pick the grapes too soon, it will not get this color. The grapes are very thick skinned with strong tannins. If you do longer skin maceration, you must age the wine longer, soften the tannins. Otherwise, it becomes bitter and astringent.” The sound of a tractor roars by. Aleks is the first winemaker I’ve met in Brda who does not use long maceration periods for his white grapes. “Two hours, maybe four—maximum six,” he tells me. Six years ago he tried longer maceration times. 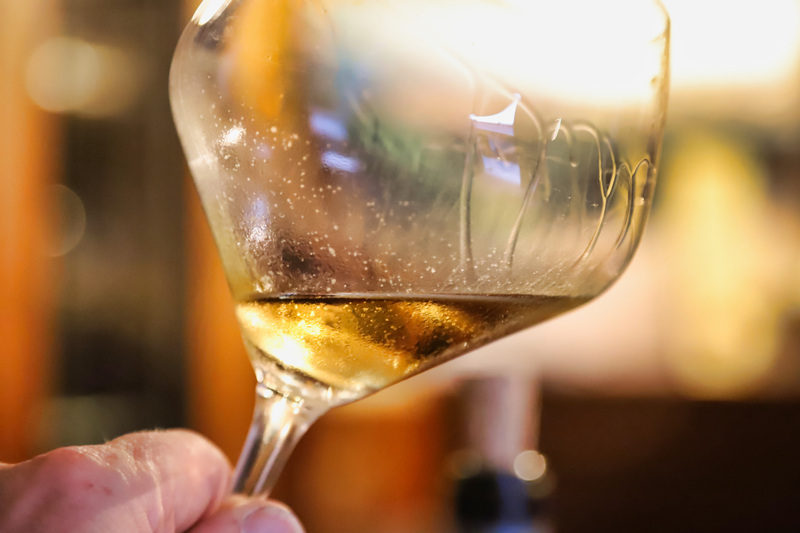 “I didn’t find that something I felt worked for my idea about wine,” he says.“There’s nothing wrong with that, I just choose to go in a different direction with macerating our white wines. Though Edi Simčič is a family business of three generations making wine, second-generation Aleks didn’t always work full time for the winery. Just five years ago he quit a high-profile job with British Petroleum to devote his time and energy on Edi Simcic. 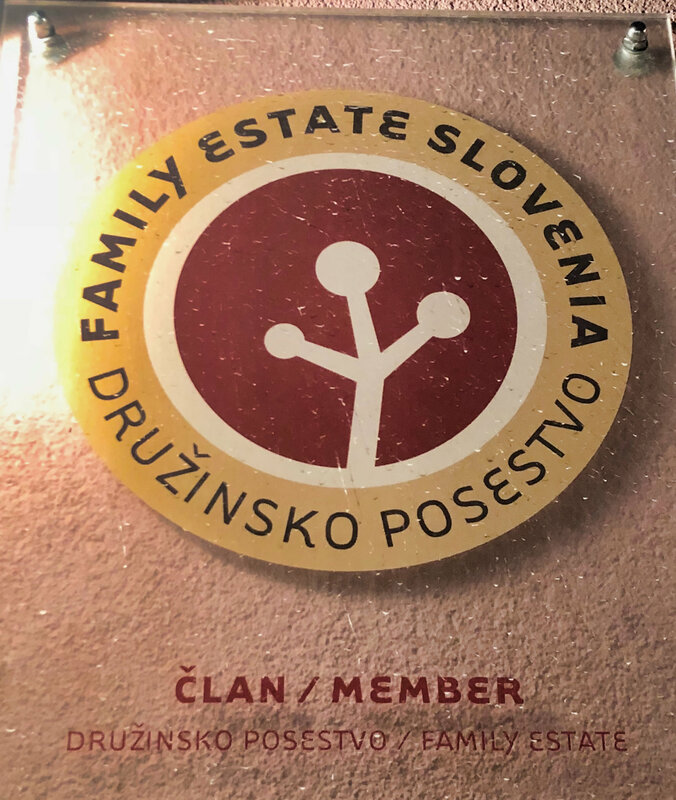 Outside the winery, I spot a plaque identifying Edi Simčič as part of a consortium of family wineries of Slovenia. Since traveling through the Balkans, I’ve noticed many family-run businesses run. In these modern times, I see less of this in the United States. Many young people choose to be on their own, make their own way and follow their own dreams. But here in Brda, Edi Simčič is the fourth winery that is multi-generational. Aleks tells me he was the same way. 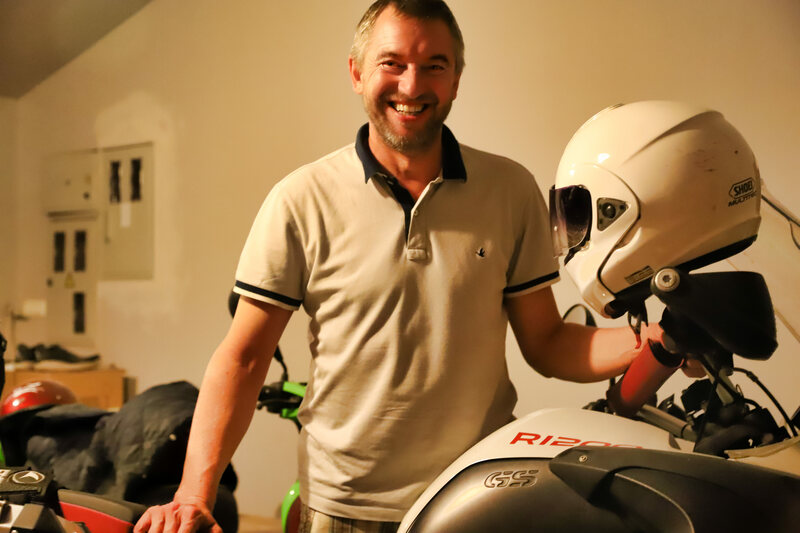 After graduating university he took a job in business, and from the mid-1990s until 2012 he would drive to Ljubljana or Zagreb every day, driving over 80,000 kilometers every year. “I didn’t want to be here,” he reveals referring to the village where he grew up. Though Aleks did work with his father in the winery during the critical times. Today, Aleks doesn’t want to be anywhere else. “Once you live here, it’s tough to go anywhere else.” He feels young people like his son see things differently than he did at that age. Aleks says the time he worked managing the entire business in Yugoslavia was an investment in the family business. It provided him the experience in marketing, sales, and management. Plus, the additional income allowed him to invest in the winery and help open new markets. But by 2012 he was done with the driving and with the business growing, eager to devote all of his energy to Edi Simčič. He pours me something completely different, but won’t tell me what it is until I’ve tasted. Aleks looks into my eyes. “It’s a 2007 Edi Simčič Sauvignon (Blanc).” I’m stunned, thinking this is eleven years old. He holds up the bottle, with a smirky yet proud smile as he shows me proof on the label. Yes, this is a 2007 Sauvignon. For the wine lovers reading this, I’m sure you understand my astonishment. For those perhaps confused, let me explain. In general, people drink white when they are young, in a few years—especially Sauvignon Blanc. That’s how they are made. So, discovering an eleven-year white wine that isn’t dead or funky is incredible. I’m blown away—I’ve had old white wines, but from Burgundy, or perhaps something from my cellar I should have opened years earlier. An eleven-year-old Sauvignon Blanc—astonishgly good. “Wow, that is something else—2007. For a long time, Aleks would make two or three trips each year to other parts of Europe and the United States.” We were the first ones to open new markets and export,” he says, “Ales of Movia made more trips, like seven or eight.” These guys were on a mission to show Slovenia to the rest of the world. He says this is more cost effective, too. We cooperate with other vineyards using the same distributor. One distributor may represent four or five other wineries in the region. So this allows the distributor to visit all of his brands from an area in a single trip. Each winery contributes to the cost of airfare and will host for a few days and then move on to the next vineyard. I sip the Triton Lex. It exhibits beautiful balance and is well structured with notes of citrus, apricot, and stone fruits—finishing even slightly austere with that minerality, brightness, and smooth tannins. Beautiful and memorable. So his first experiment used thirty percent of the wine from the barrels and the rest from the stainless steel tanks. Over the new few years, he included more new oak in the blend. By 2000 he stopped using stainless steel tanks altogether unless he makes a rose. Today all Edi Simčič wines are barrel fermented. There are two bottlings of this wine: Triton and Triton Lex. LEX is used for the wine bottled from the best selection of grapes and barrels. Lex is the Latin word for “Law.” He says Lex sets the benchmark for the best Edi Simčič wines. 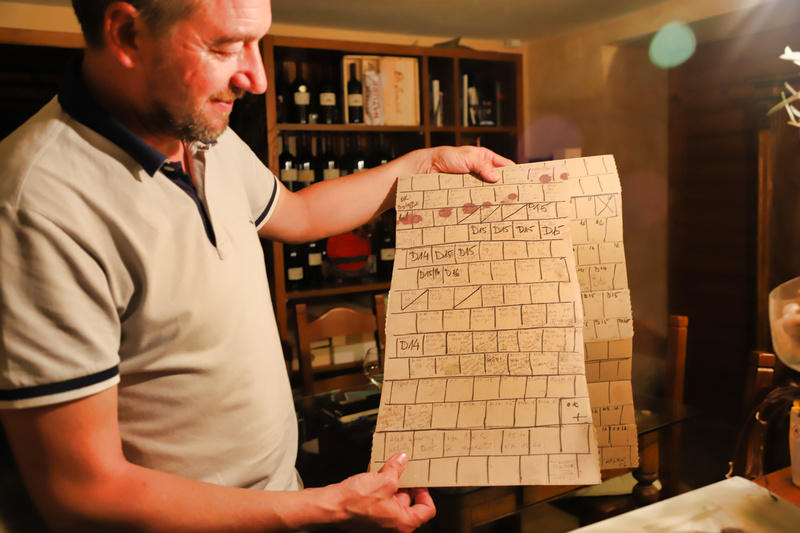 “They do not allow us to use words like ‘reserve’ or ‘Riserva’ on wine labels—legislation prevents anyone in Slovenia from using them.” So he created his own, not only does it have meaning, but it’s also easy to pronounce. He fumbles through some bottles in one wine fridge. “I have,” he drops a bottle on the table. “A bottle with the original name Trojka from 2002.” If I closed my eyes, I would never guess this wine to be sixteen years old. It still is fresh and bright, yielding aromatics of orange zest, and on the palate sweet fruit, acidity and good structure. What a treat to go back in history and taste an original Trojka. Aleks fumbles through one of the other wine fridges and pulls out another treat. I feel like we are stepping into a time machine as he pours me a taste of an Edi Simčič Sivi Pinot (Pinot Grigio) from 2006. I’m skeptical, it is Pinot Grigio. Then I remember that beautiful glass of the Ambra Pinot Grigio I had at Movia yesterday. “There’s no way,” I’m lost for words. Instead of trying to evaluate and describe this wine, I tell Aleks, I want to take in this moment—enjoy this wine. “Slovenia changed my perception of Pinot Grigio.” We laugh. Aleks is quick to point out that this is not your average Pinot Grigio. Mostly, even experienced sommeliers would have a hard time identifying this wine. It has the structure and complexity from Pinot Grigio from Alsace without the sweetness. He explains that to achieve a delicate balance that yields a Pinot Grigio that evolves with age requires low yielding vines and even ripening. 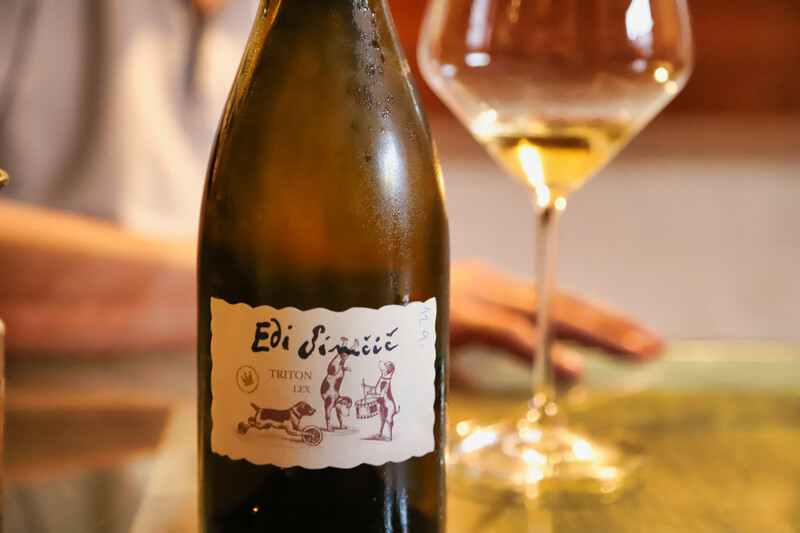 The 2006 Edi Simčič Pinot Grigio will trick most any sommelier or wine geek. Twelve years old! I tell him, “I can get used to white wines like these.” He laughs. Edi gets up every day and goes to work. Aleks now realizes that if he doesn’t tell I’m what to do, his father will try to do everything. “It’s important for him to be doing things, but I don’t want him just to look for things to do. So I must keep him handled and delegate stuff for him to do. When I ask him where Aleks sees Edi Simčič in the next five or ten years, he’s more reflective. He tells me that his son, like him when he was younger, has new ideas. “He loves to organize the workers and knows what and how to do the work here. He doesn’t just stay here in the winery or cellar. No, he does the majority of work with the tractor.” I sense not only a proud father but someone happy that the next generation is as passionate about the winery as he is. He admits that he’s always looking to make a better way to work. “I’m sure we could grow, but we can be happy and stay at this size. There’s nothing wrong with this. The financials work. We need not to grow. 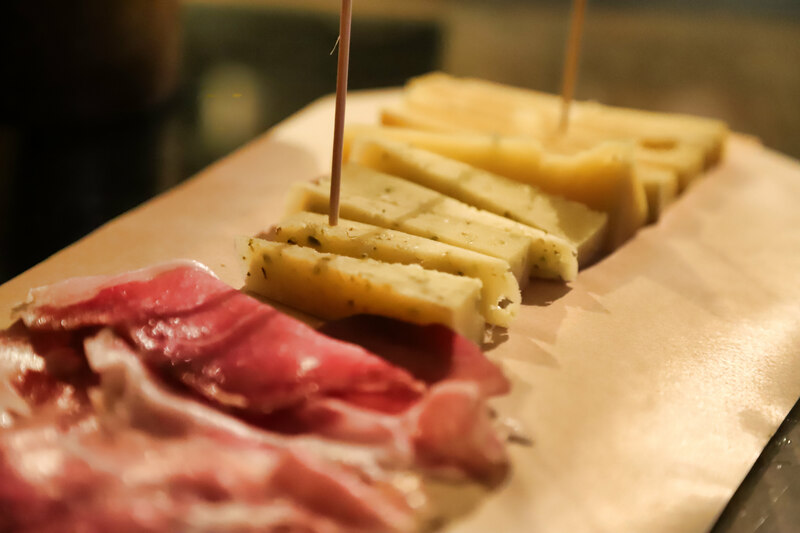 The cheese is creamy and flavorful, the herbs don’t cover up the taste of the cheese. “This cheese is from the Maribor mountains, aged one year.” He tells me referring the mountain region Northeastern Slovenia near the Austria border. Every spring and summer they move the cows from the village in the lowlands to the mountains where there are many more flowers which gives the cheese its rich flavors. I swirl my glass of Chardonnay, it’s golden and yellow. It’s lovely and balanced and packs power with a freshness and a long, satisfying finish that shows the wines core minerality. This also gives him options for blending wines. The vineyards all have different altitudes, different ages of wines, and soil composition. He swirls the glass of Kozana. This is a high elevation, very windy location with stony soil, and twenty-five-year-old wines. I try more cheese. 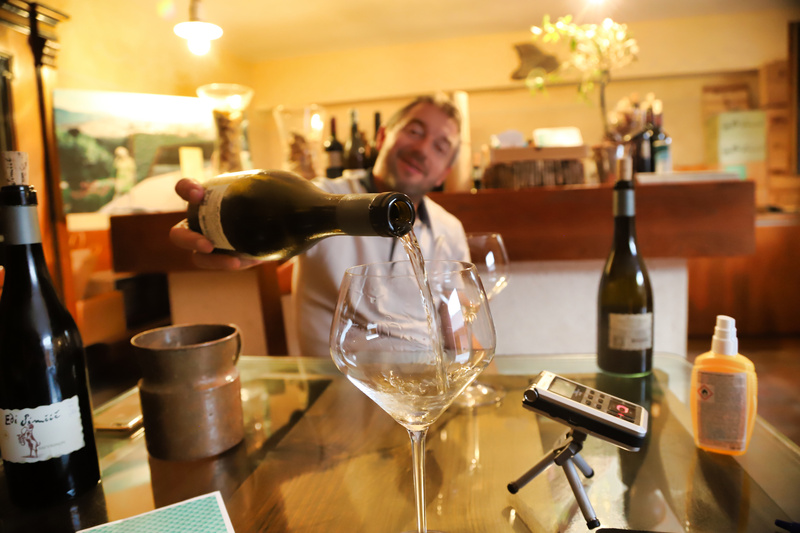 He tells me that Valter, the sommelier at my next location in Northern Slovenia, also rides a motorcycle — a BMW GS. He also is a master of cheese. Aleks reminds me to be sure to check out the cheeses Hisa Franko ages at the restaurant. We finish the afternoon tasting two red wines—both Merlot dominated Bordeaux blends. The 2014 Edi Simčič Duet Lex and 2013 Edi Simčič Kolos. With eighty percent Merlot, and ten percent each of Cabernet Sauvignon and Cabernet Franc, the Duet Lex comprises grapes harvested from select vineyards with fifteen to thirty-five-year-old vines. 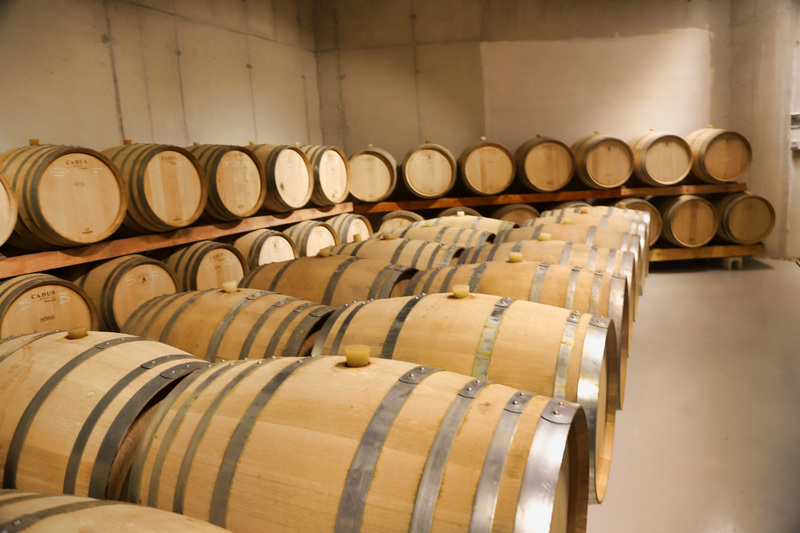 They macerate the grapes for about two weeks and then age the wine for at least three years or more in one-hundred percent new French oak barrels. The Duet Lex is dark red with a nose of cassis, blackberry, and a hint of cedar. It’s elegant, big, and a bit brooding with a very long finish. As I swoosh the wine in my mouth, I think about Merlot and the others I’ve tasted. It occurs to me that this part of Slovenia—and the world, makes terrific Merlot. Aleks pulls out a large piece of cardboard that looks like it came from a wine case box that’s been flattened. From top to bottom there a grid of boxes, or what looks like a drawing of a brick wall. 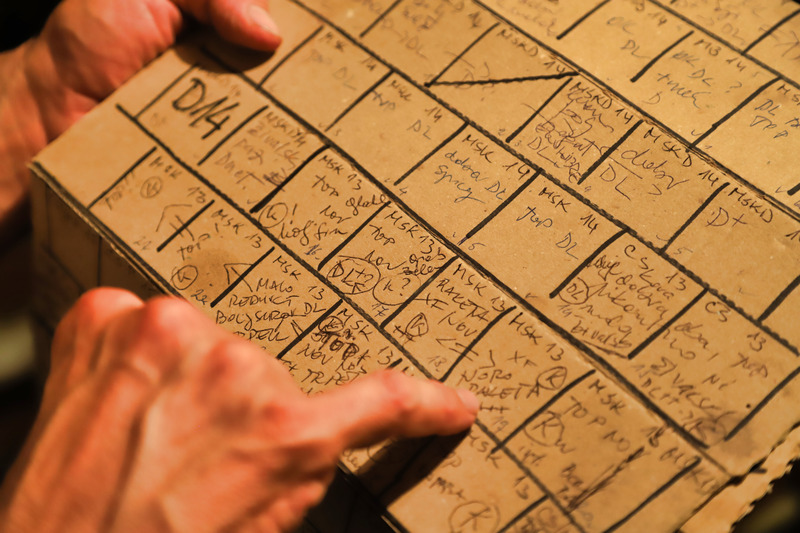 In each box are notes, numbers, and scribbles. I cannot make out what anything says or means, except for one box in the center says “OK.” Aleks tells me this is his system for keeping track of the barrels as they age. The Edi Simčič Kolos is the same blend and style as the Duet Lex, except Kolos is a special selection of only the best barrels. This long strip of cardboard holds the secret. He doesn’t bottle Kolos every year. No, he makes Kolos only when he finds exceptional barrels—from grapes selected from best sites and only in best vintages. Lucky for me, they bottled Kolos in 2013, and he is now pouring me a glass. Other vintages in the past ten or so years where he felt the quality deserved a Kolos we do a barrel selection from the grapes selected from best sites.Kolos bottling were 2012, 2011, 2009, and 2007. Aleks has his own system for monitoring and documenting the aging process for barrels of red wine—and helps him determine what goes into Edi Simčič Duet Lex and if there will be a Kolos in any given vintage. He points to a few boxes on the barrel grid cardboard. These may end up in a future vintage of Kolos. Time will tell. “Off the charts,” I’m sitting down, but need to stand up. I hold the glass up to the light. It’s practically opaque, but is deep dark crimson in color, with flavors of ripe plum, blackberry, and currants with hints of pipe tobacco and soy sauce. Big, bold, and beautiful with firm tannins and weighty mouthfeel that bursts in the mid-palate while finishing long and delicious. I’m beyond impressed. In just three days I’ve discovered more possibilities for Slovenia and opened my eyes and mind to new varietals, inspiring vinification techniques, and a shared passion and desire to push quality and to let the wine express it’s origin rather than try to be something it’s not. This is enduring and attractive. I learn that we not only share a passion for good wine, but also for good motorcycles and the enjoyment of riding and exploring the world. 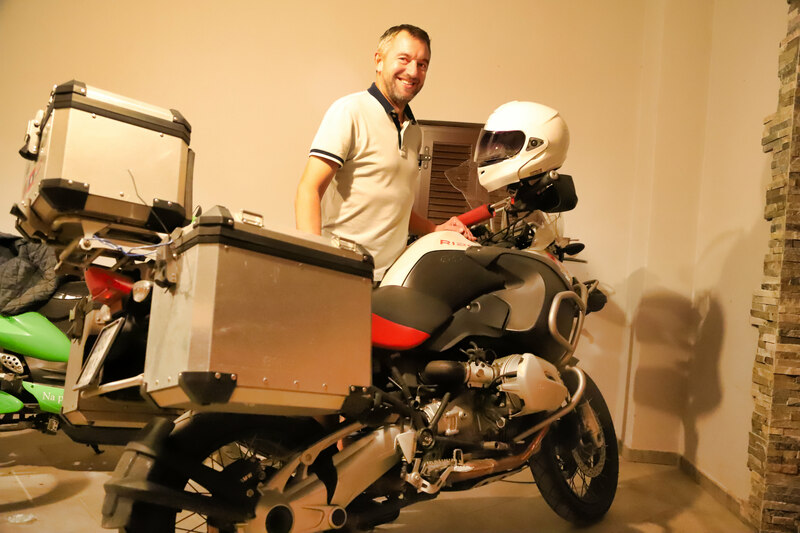 Aleks Simčič and his BMW 1200GS. 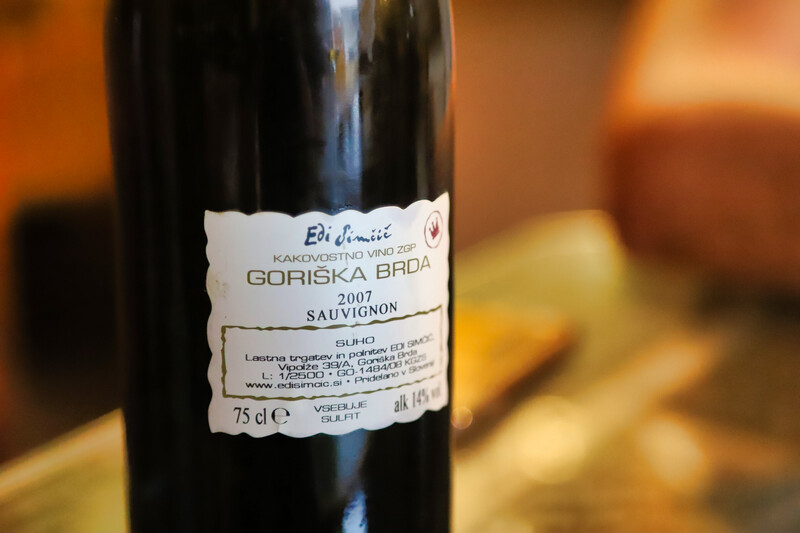 At Edi Simčič, from the 2007 Sauvignon Blanc to the 2013 Kolos, I discovered wines that could serve as a slap in the face to those wine lovers closed to anything but Burgundy, Bordeaux, Barolo, or wherever their wine comfort zone lies. This is the beauty of adventure and exploring—outside the comfort zone where the discoveries are as good, if not better, than gold, frankincense, and myrrh. Before leaving Edi Simčič winery, I check out Aleks BMW 1200GS and snap a few photos. He reminds me again to have Valter show me his bike—and the cheese. Another great afternoon in Brda. My education continues as I carry on to explore and discover.